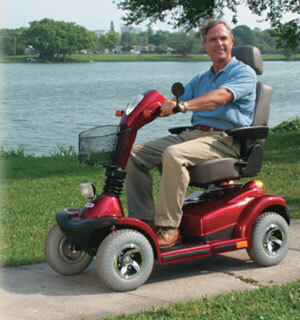 Three-wheel or four-wheel motorized mobility scooters are a popular alternative to electric wheelchairs. They have a swivel seat, handlebars and rechargeable batteries. They do not fold and therefore require either a large van for transport or a scooter carrier mounted to a car or van. Who should use a scooter? Those who use a mobility scooter should have good balance and be able to use both hands for steering. Primarily best for those who can still walk, stand and sit upright without support. 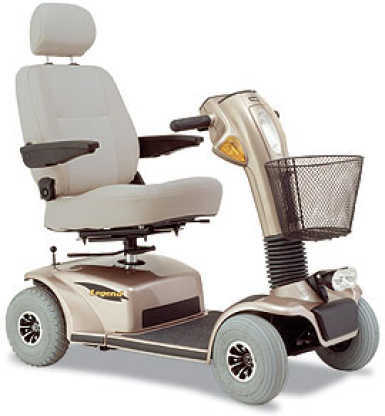 Front-wheel drive: Able to carry a maximum of 150 lbs and are primarily designed for indoor and level pavement use. They run on a single 12 volt battery and can travel between 8-16 kilometres before recharging. Rear-wheel drive: Able to carry a maximum of 350 lbs, while heavy-duty models can carry up to 500 lbs. They run on two 12 volt batteries and can travel between 25-35 kilometres before recharging. Three-wheel scooters: Maneuver easily and have a tight turning radius. They are well-suited for indoor use and are light and easy to transport. Four-wheel scooters: Have a broad, sturdy wheel base and are well-suited for outdoor use and rougher terrain.